We braved our first overnight trip with both kids this weekend. We stayed at my sister Hope's house for our Christmas with my mom and siblings. It was a lot of fun spending time with my family, especially watching Spencer interact with his cousins. I grew up surrounded by cousins and have so many fond memories playing with them. I want that for my kids as well, but it's a little trickier since we live hours instead of a few miles away from them. Uncle Ryan and Aunt Hill. Our first overnight trip went pretty well. Spenc slept great, like usual. He's a champion sleeper anywhere. 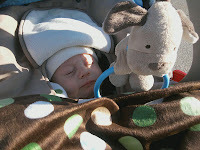 Ashton was a different story, however, since we are still working on his sleeping skills. I was able to get him to bed easy enough and even able to enjoy some wine while playing Skipbo with my sisters and niece, but he woke a few hours later and decided to stay awake for a while afterwards. I ended up having the little guy sleep with me and he happily munched away on the all night buffet while snuggled up with Mommy. Uncle Brian "holding his head!!" A rare picture with Mommy. Getting cereal and milk all over Ant Hohee's kitchen! Ashton in his warm stroller cocoon. Although we had a nice visit with my family, it was good to come home. Dave took Spencer and our dog Sabrina out to Grandma and Marmer's to go walking in the woods. Ash and I didn't want to waste the unusually nice weather either, so I bundled him up in the stroller and we went on a brisk four mile walk.